The appearance of an original Blue Note record has caused a stir in the Raggy Waltz office. The excitement coupled with the all-around greatness of the album made a write-up necessary. To the music we go! This is one of those albums where it’s hard to single out one track as a favorite. Unsurprisingly, this is one of those albums where you can listen to the entire thing through without skipping a single song. Each track is strong and is a great example of Dexter Gordon’s muscular and ebullient sax work simultaneously showcasing the rhythm section as well. The track list is straight from the bebop glory days of the 1940’s, which makes sense considering the fellas on the record. With the exception of French bassist Pierre Michelot, everyone in the group came of age during the bebop era. Bud Powell was the great pianist that successfully transferred the rapid lines of Charlie Parker’s alto sax into the piano idiom, while Kenny Clarke was one of the pioneering bop drummers. And then there’s Dexter Gordon, a giant on the tenor sax, figuratively and literally (the man was well over 6 feet tall). 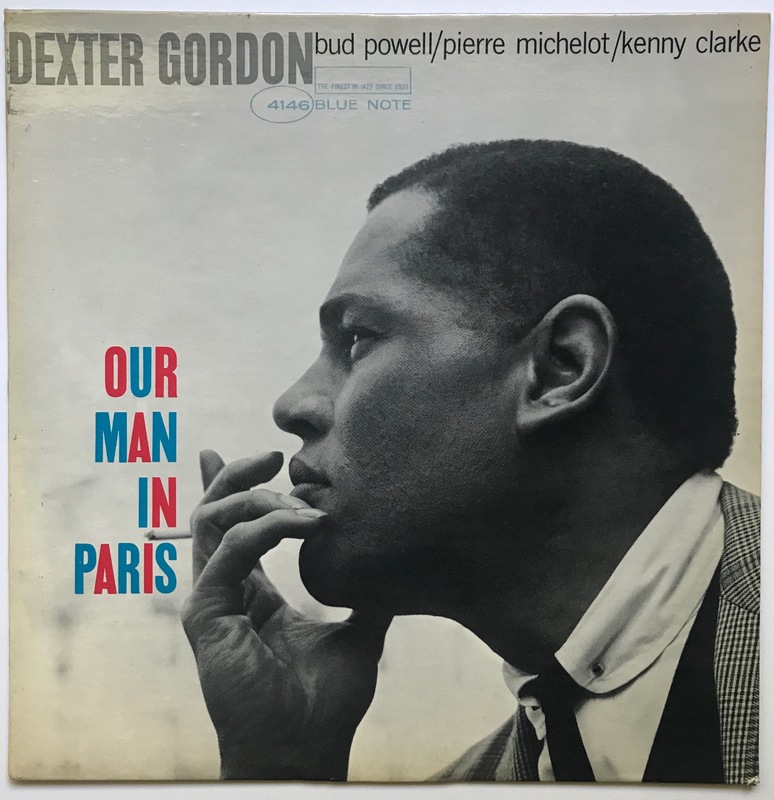 This album was recorded shortly after Dexter Gordon had relocated to Europe, one of many black jazz musicians to do so in the 1950’s and 60’s. The more tolerant and respectful climate of Europe was much more attractive to black musicians than the unrelenting racism and stress of America, and this group was made up mostly of such expatriates. Apparently, pianist Kenny Drew was supposed to be on piano and the album was going to be full of originals from Gordon, but Bud Powell ended up being in the studio instead, and since he could’t play the originals, some jazz standards were called. The results are a free-wheeling, happy session of jazz. Gordon sounds particularly invigorated on the first track, Charlie Parker’s original “Scrapple from the Apple”. He blows chorus after chorus, inserting a few bars of the ‘First Call’ bugle call and then a quote from “This Can’t Be Love”. He occasionally seems to be on the verge of leaving the confines of the tune for the more avant garde sounds beginning to be in vogue in the early 60’s, but always comes right back, swinging firmly and joyfully. Bud Powell’s playing on this track and on the album in general is fantastic. I’ve read that his playing declined during the 1950’s and that by the 1960’s, due to numerous factors, his playing was a shadow of what it used to be. To my ears, uneducated in Powell, he sounds fine, both his piano and his voice. In the great tradition of pianists such as Erroll Garner and Oscar Peterson, Bud Powell sings his piano lines, which adds to the whimsical nature of the album. The main reason why I chose to feature this track over the others (“Night In Tunisia” was an extremely close second) was because of the catchy melody and the infectious “Tea For Two” tag Gordon plays after Powell’s solo during the fours with drummer Kenny Clarke. After listening to the album through twice, this tag and the melody were stuck in my head for the rest of the day…and the next. And then, to cement the fact that this is indeed a real bebop album, Powell comes in on Clarke’s drum solo in what seems like an accident. If at least one person doesn’t accidentally barge in during the drum solo, is it really bebop? Nope. This album was a critical success, with many modern critics and fans having designated it “core collection” status, or as the high-faluting jazz snobs call it, “if you don’t own this album, do you even LIKE jazz?” The general consensus is that “Night In Tunisia” is the clear highlight of the album. Like I said earlier, it was hard for me to come up with a favorite, but “Tunisia” barely lost out to “Scrapple” on account of the latter’s rash-like infectious nature. However, since I didn’t include that version here, I thought I’d instead include a hip version of “Tunisia” from a live-ish setting. It’s Dexter Gordon as a lucky club patron in Europe would have seen him during the time of this recording. Tunisia. Tunisia! This is quite possibly the hippest, suavest album art I have in my record collection. In fact, this is part of the reason why I always liked and wanted this album. Dexter Gordon was a cool dude. He dressed like a GQ model during the 1960’s, had a rich voice that he used to great effect by introducing ballads by reciting their lyrics, and was a native Californian- all factors that made him one of the hippest and smoothest jazz musicians of his time. This album cover exudes all of that. 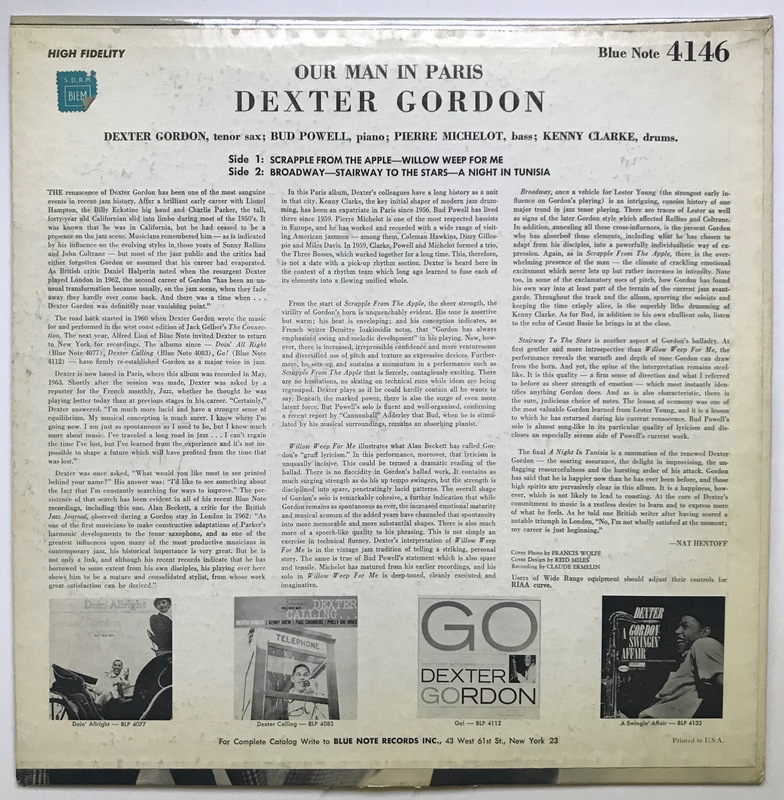 Looking like an Ivy League disciple with his club collar, pinned together with a safety pin collar pin, and glen plaid coat, Gordon definitely looked the part of a jazz musician. The side profile catching him deep in thought adds to the serious nature of the photograph, and it being in black and white makes it all the more arresting. The playful, tasteful pop of color and arrangement of the album title keeps things from getting TOO serious. After all, jazz isn’t just about being serious. It’s about having fun expressing one’s self! Francis Wolff and Reid Miles strike again. The artwork on this album doesn’t just invite attention; it demands it. You know you’re in for a treat when Nat Hentoff is in the writer’s chair. You also know you’ll need a dictionary when Nat Hentoff is in the writer’s chair, and he starts off with a beautiful word in the first sentence with ‘sanguine’. What a great word. The liner notes are informative, insightful, and interesting. Thanks to Mr. Hentoff, there’s nothing much to add, other than that the album jacket is in relatively great condition considering its age. The back is still relatively white, with barely any tearing, all good news on a fifty-plus year old album from the banner year of 1963 (at least in America). Rudy Van Gelder may not have been in the recording booth during the making of this album (shoutout to the French engineer Claude Ermelin), but his mastering skills still grace this album, and as a result his name is stamped in the runnout. By 1963, most vinyl was stamped with the fancy new presses that left no deep-groove, and this album is an example of that. The labels are beautifully crisp in their classic white and blue. Absolutely gorgeous. This is a mono recording, but the music is still front and center and full of life. On a good system, the music leaps right off the record and comes not just to you, but AT you. It’s as if Dex and the band are right in the room with me. Each time I play this album, I’m blown away with the fantastic quality of the record and the sound of the recording. Another round of applause to Mr. Claude Ermelin. The vinyl plays remarkably quiet, with not a crackle, pop, or snap. In fact, it sounds brand new to my ears, as close to 1963 as I’ll ever get (then again, I am in the American South…). The presence of the Plastylite ‘ear’ in the runnout combined with the medium-heavy vinyl make me think that this is a first-pressing. Of course, it could be a fourth pressing for all I know, and I truly don’t care. It was made before the Liberty acquisition of ’66, so it’s alright with me. Speaking of acquisition, how did a newly graduated guy like myself come to be adding this album to my library? One of the coolest aspects of running this blog has been correspondence I’ve had with the readers. Some are a few states away, others a border away, and still others an ocean away. Two weeks ago, a reader all the way in Belgium contacted me and after saying a lot of nice things that made me blush (a hard thing to do for somebody that looks like me), told me he wanted to send a gift. This being 2018, I was highly suspicious, but decided to trust him. A week later, a package arrived in the mail. I opened it, and began to weep. It looked absolutely beautiful. Then I took the vinyl out and began to weep even harder; it looked pristine. Doing my best to clear my eyes, I put the record on my turntable and carefully dropped the needle on the first track. There was the delicious quiet swish as the needle slipped into the opening grooves, then the crisp sounds of piano, bass and drums sounded. As I weeped even more, I decided to check what a good condition copy of this album goes for these days. The results made me cry so loud, I had to replay the album so I could actually hear it. “Willow Weep For Me” has a new meaning for me. Amen and amen. There have been many highlights and high points during my blogging experience, but this is certainly the highlightingest and high pointingest. A beautiful album, one that I’ve always wanted to eventually own, now mine. For the absolute best college collector price in the world. To my Belgian reader and friend, if you are reading this, thank you again for this graduation gift/birthday gift/Christmas gift/Kwanzaa gift. It will forever have a special place in my record collection. Great write-up of a great LP! I’m going to have to go give it a re-listen with newly attuned ears. Thanks also from your readers to your Belgian benefactor — we get to enjoy some fine jazz writing thanks to his generosity! Thank you! Leave a comment after you re-listen to the album; I’m curious to hear your opinion and thoughts on it. And yes, three cheers for him! The “benefactor” is not Belgian, he’s French and presently lives in Belgium. Ok, let’s just say he’s a true European.